The Gazetteer for Scotland is a vast geographical database, featuring details of towns, villages, bens and glens from the Scottish Borders to the Northern Isles. It includes tourist attractions, industries and historic sites, together with histories of family names and biographies of famous people associated with Scotland. 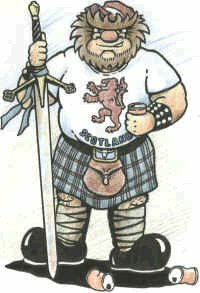 The goal of Gathering of the Clans is to act as a single point of reference for information about Scottish Clans, culture, history and events. Scottish Heritage, USA (SHUSA), was founded in 1965 to recognize and enhance the original bonds of ancestral and national character among peoples of Scotland and North America. In practical terms, its mission translates into support of the National Trust for Scotland and like-minded Scottish conservation and preservation societies. Intermail is an international corporation which publishes special reports for distribution in the world's leading media and on the Internet. Electric Scotland where you'll find over 8,000 pages of information on Scottish history and clans as well as people and places of Scots descent. They've got books on Scottish history for you to read, recipes for you to enjoy, Scots language and stories in Real Audio to listen to and tourist information on Scotland. Thay also have a great Web Board community in which you can message and chat and lots more to see. Great Scot Importers of Fine Scottish Goods. - Scottish and Highland Clothing and kilts. The Celtic Trader source for Celtic and Appalachian music, music books and small instruments. Dunedin Scottish "Quality without Question". Celtic Signs Jim Potts carves homeplace signs and other home accents in Celtic lettering and designs on naturally weathered wood from the Blue Ridge Mountains of North Carolina.